What’s lurking deep down in your carpet fibers? 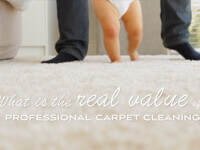 With regular professional carpet cleaning, your carpets will look nice and smell fresh, but did you know the real value of professional carpet cleaning goes much deeper than what you can see? The filtering properties of carpet result in better air quality for your family and guests—but only if your carpets are regularly professionally cleaned. If not… well, let’s just say some unsettling things happen on a microscopic level. Watch this short video to find out more. It’s important to be aware of what may be lurking deep down in your carpet fibers. To enhance the quality of your living space and maximize the life of your carpet, regularly scheduled services by an experienced professional using powerful equipment and cleaning solutions are not just well-warranted, but essential.